My readers know I have picked the Canon EOS-1D X as the best DSLR in sports and wildlife photography four years in a row. With the introduction of the Mark II model, it is living up to its venerable predecessor's reputation. In the past few months, I have taken the EOS-1D X Mark II on global photo shoots, from the steamy jungles of the Amazon to the freezing temps of the high Arctic, plus Alaska and Canada. The camera is simply a joy to use and an excellent performer. You can read my review and keep checking back for added comments since I will be taking the body out for further testing and analysis. Below are a few tips from Canon on how to get the most out of the new camera. When shooting in Live View with the EOS-1D X Mark II, it offers menu options to determine how the Live View image is displayed. Within the Exposure Simulation options, the second option (denoted by the Depth of Field preview button) may prove useful when shooting in low light conditions. In this setting the display will be artificially adjusted to be easier to view, to help with exposure, composition and focusing. However, to show a simulated exposure and to ensure you are not over or underexposing the scene, you should press the Depth of Field button. This will initiate the Exposure Simulation setting. Using an HDMI cable, it is possible to display a Live View image on a monitor, to give you a larger screen on which to judge exposure, focus, composition or present to others. When shooting in Live View stills, the camera does not pick up any audio, so there will be no audio output to the TV set. The GPS receiver within the EOS-1D X Mark II stores GPS data with each image taken. However, if you are recording a log, this data is stored in the camera’s internal memory. The frequency with which you set the GPS update will determine how many days of data the camera’s memory can store. If the update frequency is set to 1 second, you will be able to store around 4.1 days of logs. However, if you reduce the frequency to every 30 seconds or less, you will be able to store up to 100 days. If you need to store data for a longer trip, reduce the frequency of the updates to ensure you keep all the data – once the camera’s internal memory is full, it will delete the oldest log files to create more space. The EOS-1D X Mark II allows you to use the GPS receiver as a GPS logger. This will record not only the location for each picture, but also the route the camera travels. This data is stored to the camera’s internal memory and can be viewed through the Map Utility software included with the camera. The GPS mode has two settings: In Mode 1, the camera will continue to track the GPS route even when the power switch is set to off, and In Mode 2, turning the camera off will also turn off the GPS logging. If you wish to preserve battery life and do not need the route logged when the camera is off, set Mode 2. In Auto Power Off, the camera will still receive GPS updates even when set to Mode 2, so the battery may still drain faster than expected. When travelling, one of the first things you should do is set the time on your camera so your files all have the correct time set on them in the EXIF data. When you go to the time/date settings option in the menu, you may find the date setting cannot be changed. If this is the case, it is because you have Auto Update set in the GPS settings of the camera. If you would like to manually set the date/time and time zone then first disable the Auto Update time setting in the GPS menu options. To enable accurate time setting within the camera, you can use GPS time from satellites to set the camera’s clock. The accuracy is within +/- 0.02sec. If you have several cameras, this is a good way of making sure they are all in sync; it is also useful when travelling as you can accurately update the clock wherever you are in the world using the auto-update setting. Within the Auto time setting, there is a Set Now option to force update the clock. If this is greyed out, or if the clock is not updating, it is because the camera cannot ‘see’ enough satellites. To be able to update the time, the GPS receiver must have a lock on at least 5 satellites, so you should move to an area with a clearer view of the sky to update the time. The EOS-1D X Mark II’s high precision GPS receiver allows you to select the positioning interval – the frequency at which geotag data is generated. If you were moving around a lot, then it would be wise to increase the frequency to ensure more accurate results with each image. However, if you are staying in one location, then the frequency can be reduced. This will have the advantage of preserving battery life – the more frequently the GPS data is acquired, the faster the camera battery will drain. The EOS-1D X Mark II includes a high precision GPS receiver to allow you to geotag images and movies. When shooting a movie clip with the camera, the GPS location is taken at the start of the movie clip recording, so if you move over a distance while recording, the overall journey taken during filming will not be recorded. The EOS-1D X Mark II includes an advanced GPS receiver to allow you to GPS tag your images directly into the EXIF data of each image while shooting. When looking at the GPS information display, you may see either a 2D or 3D notification next to the Satellite Reception setting – if it shows 3D, then the camera is also recording elevation data along with Latitude and Longitude. If you only see 2D, but want to also record the elevation data, try moving the camera to a position where it has a better view of the sky, with fewer obstructions likely to reduce the satellite signal. The EOS-1D X Mark II features an adjustable Movie Servo AF speed to change the speed of focus from slow to fast when performing focus moves such as a focus pull. Within this setting there are options for when the setting takes place: Before Shoot and During Shoot. This is adjusted with the ‘When Active’ setting. If set to Always on, you will be able to see the speed of focus change whether you are shooting or not. However, when set to During Shooting, the AF Speed adjustment will only take place while you are actually recording. When not recording, the AF Speed will be at the default setting. For precise focus when shooting in Movie mode, it can be useful to magnify the view to be able to see it in fine detail. In this magnified view, the Movie AF will still function. However, even if you have FlexiZone or Face and Tracking AF activated, this will not function when zoomed in. If you wish to track a moving subject, you’ll need to zoom back out to standard view to enable it. Many EOS models feature a 3.5mm jack input for plugging in a microphone to record stereo audio. However, in a first for the EOS system, the EOS-1D X Mark II can also accept a line level input from an external mixer or recorder, without risking damage to the audio circuits. To use the input as a line feed, find the audio settings in the Movie functions menu and select ‘Line Input’. Just as photographing moving subjects may mean you encounter obstacles moving between you and your subject, the same is true when shooting Movies. The EOS-1D X II helps avoid focus issues like this in Movie shooting, with a similar setting – Movie Servo AF track sensitivity. It works in the same way. If you want the AF to respond immediately to subjects appearing beneath the active AF area, move it towards responsive. Or if you want the camera to be less bothered by obstacles crossing between you and your subject, move it down towards locked-on. When using AF to pull focus on the EOS-1D X Mark II, it is possible to select one of 10 levels of focus adjust speed, from fast and snappy to slow and deliberate. This makes control of the focus simple and allows natural looking focus pulls to be created in AF. If you find the AF Speed function is greyed out, check which AF mode you are in – the AF Speed can only be set in FlexiZone, not in Face and Tracking AF. The AI Servo Movie AF functions make it very simple to track a moving subject. However, Servo AF is most useful when you have full control over when it functions. To start use a button like the Depth of Field preview button and to stop the Movie Servo AF use the Movie Servo AF Pause function. This can be set in the Custom Controls screen of the Custom Function menu. In Live View shooting you can select one of two focus modes, either FlexiZone or Face and Tracking. If you select the Face and Tracking option, but no faces are detected in the frame or you do not select a subject to focus on, the camera will switch to FlexiZone focusing. If you find the touchscreen is not functioning as you expect, it could be because either the screen has moisture on it or your finger is wet. Try turning off the camera and using a cloth to dry the screen as well as drying your finger tips. When filming in damp conditions, try to keep the screen and your fingers as dry as possible or disable the touchscreen and use the multi-controller to change focus points. The touchscreen control on the EOS-1D X Mark II has two levels of sensitivity: standard and sensitive. Standard should prove sufficient for most uses, however the sensitive setting will make the screen more responsive, which is useful when you want to minimise the pressure you apply to the screen when filming. If you want to avoid accidentally adjusting focus while filming, then switch off the LV Touch Control setting. This will disable the touchscreen functions and you will need to use the multi-controller to move focus points. In Live View, the EOS-1D X Mark II can shoot up to 16fps in RAW. If you find the frame rate is slightly slower than expected, check your ISO setting. If the ISO is set to H1 (102,400) or higher, then the maximum frame rate in Live View will drop to around 14fps rather than the maximum of 16fps. The EOS-1D X Mark II features several silent shooting options to reduce the sound when taking stills by controlling the re-cocking of the mirror. When the camera is set to Live View shooting, no matter which silent shooting option you have set (S, S-High or S-Low), it will not reduce the sound any further – this is because the noise comes from the mirror which, in Live View, is already raised and makes no sound. In low light you may find the Exposure Simulation function doesn’t work as there is not enough light to give an accurate simulation. If this happens you’ll see a flashing 'Exp.Sim' in the bottom corner. If you want to try and get Exposure Simulation under lower light conditions, make sure that Highlight Tone Priority is set to Disable and that the maximum ISO speed is expanded in the ISO Speed settings. This will enable the exposure simulation to function in lower light levels. If you’re looking to shoot in 4K resolution on an EOS-1D X Mark II but can’t find the 4K resolution options, check the MOV/MP4 setting. If you have the camera set to MP4 file type, the 4K resolution options will not be available. Instead switch camera to MOV and the 4K resolution and frame rate options will be available. All operations carried out by the camera lens are actually powered by the camera’s battery. This means that continually focusing or using Image Stabilisation (IS) will drain the camera battery faster. Not all lenses use the same amount of power to focus or perform IS, so if you notice that the battery is depleting quicker than usual, it is mostly likely because lens is drawing a lot of power. It is therefore especially important to have spare camera batteries with you if you are shooting with large telephoto lenses. When shooting in very cold conditions, you may notice that the camera’s maximum drive speed decreases from 14fps. This is normal when the battery gets very cold as it cannot provide enough power, so the drive will drop to around 10fps. If you need to maximise the drive speed when in cold conditions then try and keep the battery as warm as possible with shielding or insulation around the lower battery grip. When shooting in hot temperatures, the camera’s internal temperature will rise. If you are shooting continuous bursts, this will exacerbate the temperature increase. If you notice that the camera drive speed seems to be slower than normal, have a look at the drive speed icon on the top plate LCD. If it is flashing, then it is a sign that the camera is too hot. You can continue to shoot but the drive speed will drop to avoid excess heat build-up and risk of damage to the camera’s internals. The EOS-1D X Mark II features a variety of options for selecting AF points depending on the subject you are shooting. When working in low temperatures, you may find it difficult to see the viewfinder display for either Area AF or Large Zone AF. If this is the case, then you should switch to one of the other AF selection modes – such as Zone or AF Point Expansion – as these will be clearer. When using Live View or Movie shooting on the EOS-1D X Mark II, the camera will get hot. This is especially true when shooting 4K video and extra processing is required, generating more heat. The camera, like all EOS models with Live View and Movie shooting, has an internal temperature cut-off and displays a warning icon when it is hot. If you see this icon (a hot thermometer graphic) even if you have finished shooting and the camera has finished writing to the card, the card will still be very hot. In this case, open the card slot door open, wait a couple of minutes and then remove the card. When using a new battery with the EOS-1D X Mark II, you may find the camera takes some time to turn on. This is simply the camera registering the battery. If you think you might need rapid access to shooting, then when you get a new battery, put it in the camera and turn it on so the registration is completed beforehand. Keeping batteries in top working order requires that they are calibrated from time to time. By calibrating batteries, you ensure that they hold their charge and also you are able to accurately report how well the batteries hold their charge when in the camera. When performing a calibration charge with the LP-E19, the charger will fully deplete the battery and then fully charge it. It is best to begin the process when you have time, as it will take around 18-19hrs in total. To maximise the performance of the calibration charge, begin calibration with an almost exhausted battery. The EOS-1D X Mark II was launched with a new battery pack - the LP-E19 - that features a higher capacity to cope with the demands of the new camera. However, the LP-E19 can also be used in older EOS-1 series cameras as far back as the EOS-1D Mark III models. Equally, the previous batteries from the EOS-1D Mark III/IV and 1D X (LP-E4/N) can be used in the EOS-1D X Mark II. When using an older model battery in the EOS-1D X Mark II, you may notice the maximum drive speed is not a fast as expected. This is because the older batteries do not provide enough power, so the drive speed will drop from 14fps to around 12fps. If you need the fastest frame rate, you should stick with the LP-E19 battery pack. In the EOS-1D X Mark II the AF points are always illuminated in red to make it easier to see them in a wide range of lighting conditions. If you are shooting in very bright light, then you may find you want them to be brighter still – if so, the last tab in the AF menu will be useful. Here there is an option to choose “Brighter” in the AF Point Brightness setting. Conversely, if you are shooting in low light, you will probably find it better to leave the setting on “Normal” so it does not obstruct your view of your subject. Like the EOS 7D Mark II, the EOS-1D X Mark II gives the option of recording video files in either MP4 or MOV formats. MP4 files are more easily shared with MOV and are better for editing later. When selecting MOV files, you will have the option of recording either as ALL-I (intraframe) or IPB (interframe) CODECs. When switching to MP4 recording you will not see an option for CODEC selection. This is because, in MP4, all videos are recorded as IPB rather than ALL-I. To access the ALL-I option, you will need to switch the camera into MOV file type. 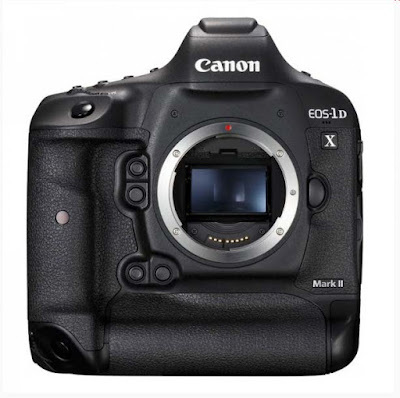 Like its predecessor, the EOS-1D X Mark II features dual card slots. However, for the first time, one of these slots is for CFast 2.0 media. This new standard of memory card, which looks like CompactFlash (CF), actually features much faster write speeds (up to 600MB/sec vs. 167MB/sec for CF). If you want to shoot video in 4K at 50 or 60fps, or Full HD (1080p) at 100 or 120fps but find the camera keeps stopping after a few seconds, this is because you are using a CF card rather than a CFast card. To utilise the faster frame rates, you will need to put a CFast 2.0 card in your camera as even the fastest CF cards will be unable to keep up with the data rate required. 4K video comes in two types – UHD 4K, designed for television delivery and DCI 4K, designed for cinema delivery. The differences in pixels are small but important, with UHD being 3480x2160pixels and DCI being 4096x2160. The EOS-1D X Mark II shoots its 4K at the DCI resolution, so if you are planning to output your movie to TV, you will have a few extra pixels horizontally to play with or to crop out. When shooting your film footage, you should remember this and avoid framing anything important too close to the edge of the frame. For the first time in the EOS range, the EOS-1D X Mark II offers the ability to focus at f/8 at all 61-AF points depending on the lens used. This means that Extenders can now be used with f/4 lenses and you don’t need to stick to the central point as has been the case before. Additionally, the central 21 points will give cross-type focusing, not just horizontal or vertical focusing. To make use of this, you need to be aware of which lens and Extender you are using, as not all combinations give access to all points. In a lens/Extender combination, the Extender is the most crucial part – to use this new f/8 focusing, make sure you are using one of the latest Mark III Extenders. With the Mark I or Mark II Extenders, the f/8 focusing ability will not be possible.